Emily designed the Loch hat and mittens shortly after moving to Scotland, as part of our lace collection Handmade in the UK. If cables are my forte, then lace is Emily’s! The collection of 10 lace pieces includes the popular Lush cardigan and Vivid blanket – if you love Loch, then perhaps Handmade in the UK would be a perfect gift for a fellow knitter (or you!). Emily’s lovely sister-in-law Joy modelled the Loch hat and mittens on a family trip in Glencoe, a beautifully scenic valley in the Scottish highlands. The design was created using Skein Queen opulent cashmere in the exquisite pale teal ‘cloudless’. It seems to be a rule (or at least I have been told) that red-heads look great in green. Other colors too, of course, but most definitely green. This is 100% true for my lovely red-headed sister in law. She looks amazing in emerald green, she LOVES emerald green, and when I saw a beautiful skein of emerald green cashmere I thought to myself: perfect! It was Sweet Fiber Cashmere DK and I think the color was a one-of-a-kind. There was only 1 perfect pattern to match my perfect skein: Loch. While I do love the mittens, it had to be a pretty cashmere hat. This was my Christmas gift for Michelle last year and since I have seen her wearing it, there will definitely be more green knits for her in the future! So, pick that perfect skein out of your stash (or treat yourself to some beautiful cashmere) to cast on a some sumptuous mittens or a perfect lacy hat. 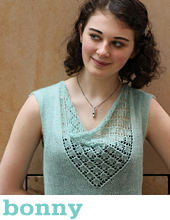 Know a knitter who loves lace? Click the links below and share this post! Thank you so , so much for your amazing generosity! Thank you so much for. All the lovely patterns! Thank You so much! I cannot wait to make a matching hat and mittens and I just got the most perfect yarn in my mail box on Monday. I will post a pic when they are done! Thank you so much for all the free patterns – ! They are lovely. Thank you so much for the 12 Days of Christmas!! It is a great idea. It is very generous of you. I look forward to your email every morning! I feel like a little kid again! Merry Christmas to you guys! Thanks :) It’s fixed now.